Louis absolutely loves playing tug-of-war with his Kong toy. We bought two new ones a few weeks back and he’s already destroyed one. These toys used to last ages but maybe the manufacturers have “cost reduced” them recently. 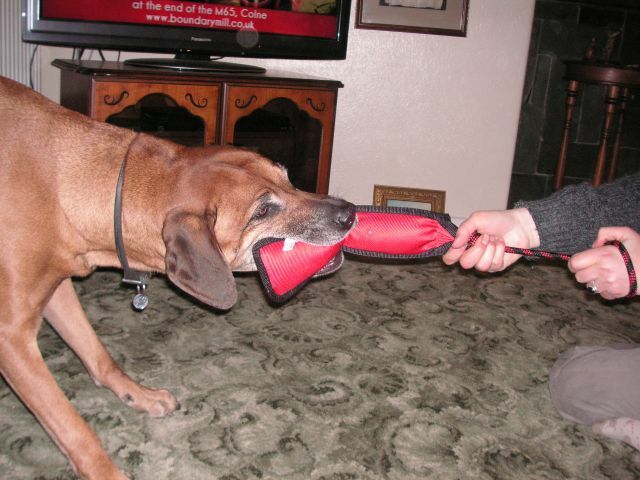 Here’s Louis on one end of the tug toy with Sue holding her own against the onslaught. He gets terrific grip on the carpet so he’s hard to beat (for Sue anyway – I never give in as a matter of principle despite the pain!). It won’t be long before we have laminate floor throughout the ground floor and then we can relax a little and suffer no more shoulder strains as he can’t get the same traction.